Moisturizing and protective, Lip Care Stick nurtures dry, chapped lips, soothing, softening and nourishing even the most sensitive lips. Provides a soft, silky shine. Formulation: Unlike conventional lip care products, this formulation promotes healthy lips without causing dependency. Candellila and carnauba waxes and sweet almond and apricot kernel oils seal in moisture to soften and smooth dry lips. Antioxidant shea butter with rose petal, rose hip, anthyllis and carrot extracts fortify, soothe and soften. This has always been one of my favorites. A bit too pricey for the amount of product, but quality nonetheless. Dry Air Lips - Cool Weather Lips - Chapped Lips? This product isn't made with wax (paraffin or bees) - not knocking other brands, I'm just saying, Dr. Hauschka lip balm and lipsticks are unlike any other lip product. This product does exactly what it should cares for and moistens the lips - period - and. This product has no equals. Other balms cause dryness and various allergic reactions on sensitive lips; this is the only one we have found that does not. An added plus, it pairs beautifully as a base for the also unrivaled Dr. H. Lip Gloss. I keep this in my make-up bag in my purse and use it all the time under lip color or just to revitalize lips throughout the day. Great to put on to walk outside to protect lips. The Lip Care Stick is great in the dry climate of New Mexico! Have used this for years. If I am having problems with cold sores I know to use it immediately and some times they never come to fruitation Would recommend it . I started using Dr. Hauschka Lip Care Stick about 10 years ago and I have been seriously devoted since then. I never leave home without it. My lips stay hydrated even if I neglect them for awhile. My previous sticks caused my lips to be dried out even with constant use. I never have this feeling with Dr. Hauschka. 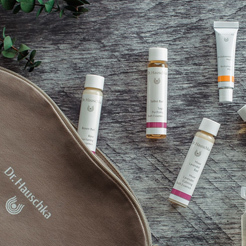 I have been using this product for @ 10 years when I first discovered Dr. Hauschka products in store in Anchorage, Alaska. I am sending this with my daughter to Antarctica. Amazing lip care stick! This is the best lip balm ever! I buy it as little gifts for friends and they are amazed how great their lips feel. I discovered this when I learned that other lip balm had ingredients that caused you to become dependent upon the product for moisture. This keeps out the New England winters- I am outside daily in all weather and all temps. This product really helped my dry lips throughout the winter! I love it! great scent but is really liquidy which does moist your lips when you put it on but this doesn't last for very long. Also the way the stick is in side of the tube is really annoying. the product bends out of shape a lot and gets all over the place. Sorry to hear you are not 100% satisfied with your purchase. If you'd like further assistance finding the product that's right for you, please give us a call at 800-247-9907 9am-noon and 1pm-4:30pm Eastern Standard Time, Monday through Friday. ALways a fan of any products I have tried. Love the fact you can put together sample size bags. Won't go without clarifying toner. Seems alright but my main complaint is that it doesn't stay up when I press it on my lips - it just pushes back into the vial. Excellent. I use it before bed time.. Lips are smooth and refreshed. This was no help for end of winter dryness, not the really cold weather but March frosty temps. This lip care stick is convenient to use and has no fragrance or flavorings, which is difficult to find. I wish it were a bit more moisturizing. At first I was very hesitate to get this product, due to my life long loyalty to $1 chapsticks. But I am glad I made the leap to purchase this lip care stick. It it unbelievably smooth and easy to apply. It has a little smell, nothing too outrageous. I apply at most three times a day. I have purchased more chapsticks and lip treatments than I care to admit. This lip treatment leaves my lips moisturized, but not greasy so it's wonderful to use before lipstick. This lip care stick is wonderful. A welcome addition to my Hauschka kit! I have often wanted to purchase the lip care stick, but for some reason never did. What a lovely gem! The balm is moist but not heavy and lasts quite a while. Highly recommended! I've loved this lip care stick for many years. It's smooth and has just enough shine. I'd like to see a screw on cap though because it sometimes comes loose. I live in a four-season climate. Cold winters are tough on my lips. I've tried several other lip balms, esp. WFoods which smell great but tend to dry my lips out. Some balms have ingredients that make dry lips worse. Gave Dr. H. a try for a couple of weeks now. Seems good. Goes on well, not oily or greasy, and doesn't dry my lips. As always-- Dr. Hauschka has wonderful ingredients and this lip care stick is so soothing and protecting. It goes on clear and has the consistency of a chap stick rather than a lip gloss. They make a great little gift for loved ones. This Lip Care Stick was kind of waxy and not at all creamy like I was expecting. Too expensive also. I’ve been using this for years and often ask friends to bring it back from Germany as a “souvenir“ because it’s pricey. I haven’t found anything else I like as much. I tried this for the first time and my lips became sore and couldn't seem to get enough moisture or relief. I do believe it has to do with my skin biology, as the ingredients are lovely. Even my husband will use this lip care stick in winter, and he normally hates such products. This one actually does what it is suppose to do, without causing your lips to get more dried out as a reaction to use -- instead it really does nourish them. And you only need a little for it to work, so it lasts well too. I love this for my lips. The texture is lovely for my dry lips in winter and it feels so good - I use it year round as a treat! Feels good knowing the ingredients are natural! New to Dr. H products. I’ve used other natural lip balms in the past but this one is by far my favorite. I love this product! It goes on really smooth and keeps my lips from getting dry. I also really like the smell! Lip care stick is the best lip balm I have ever used. It moisturizes dry lip without feeling waxy or heavy. Other brands actually made my lips drier. Dr. H is great ! This is one of very few balms that doesn't cause my lips to create that white film. I absolutely LOVE using it and it has made my lips normal! I wish it were a tad smoother, but am very happy with it overall. While it seems to wear off pretty fast, one tube lasts for quite some time so it is well worth the cost! This lip stick helps to keep my dry and chapped lips well nourished and helps to relieve the chap. I really enjoy this product. It has a mild scent and applies easily. Applying a lip pencil works really well after using this product, as well as applying lipstick directly on top. I have had no issues with chapped lips this winter and would recommend this to others. Absolutely love the lip care stick. Use it all the time especially during our cold Northeast winters! Highly recommend if you get chapped lips. Love Dr. Hauschka products but this one is not my favorite. For my lips it did not do the trick. It made them feel more dry. Every year I buy several of these for my family. Everyone loves this one! They can’t wait to get it! I truly believe that this is the best lip care stick on the market. It's smooth and replenishing and your lips never feel like they're dry after putting this on. My fiance works in construction and is outside all year round and he too will only use this product in the winter to help chapped winter lips. I love the lip care stick by itself or as an additional moisturizer underneath my lip stick. It provides the extra moisture i need especially during the dry winter months. I have used this Lip Care Stick for over 20 years and it is the BEST! 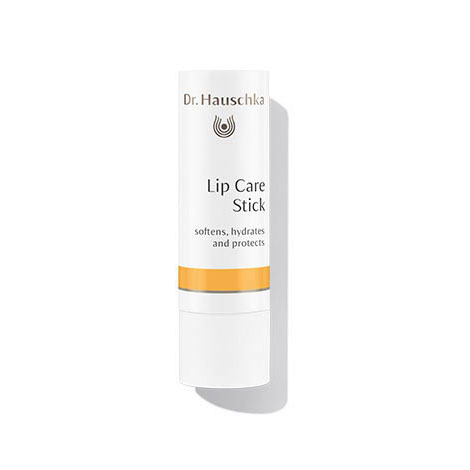 Unlike other lip care products that you can become dependent upon and require frequent applications, Dr. Hauschka Lip Care Stick treats the delicate skin on the lips and leaves them moist, soft and protected. Highly recommended. It's a secure feeling to use this clear lip moisturizer, knowing that it's clean and natural with no harsh chemicals. The stick allows you to apply it without putting your fingers in the product. I have large lips that are very prone to dry out during the colder months. While this balm smelled AMAZING, I found that it did more harm than good when I put it on my lips - it made them very sensitive and a little cracked. This is a good lip moisturizer. I gave it 4 starts because it leaves a bit of a yellowish residue, which is quite noticeable. I used to mostly use it before going to bed, but tried to avoid during day time. Other than the residue issue, this is a good quality product, up to Dr Hauschka's standards. I fall in love with this lip care stick. Definitely a must have!! This lip care stick hydrates deeply and I’ll definitely buy this again. I used this while on a month long trip to Europe. It kept my lips well hydrated while hiking every day. I now use it in my dry, cold climate. Nothing has worked better for me. Keeps my lips winter proof and gives me my natural plumpness without any waxy build-up. I usually make all my own skin care balms with oils and beeswax, but this is one of a few Dr. Hauschka products I always buy because nothing compares! The scent is also wonderful, if it were a perfume I would buy it in a heartbeat. Apply directly to the lips as needed throughout the day. Protect against light and heat. Ricinus Communis (Castor) Seed Oil, Rosa Canina Fruit Extract, Simmondsia Chinensis (Jojoba) Seed Oil, Lanolin, Beeswax (Cera Alba), Daucus Carota Sativa (Carrot) Root Extract, Butyrospermum Parkii (Shea) Butter, Euphorbia Cerifera (Candelilla) Wax, Copernicia Cerifera (Carnauba) Wax, Rosa Damascena Flower Extract, Prunus Amygdalus Dulcis (Sweet Almond) Oil, Anthyllis Vulneraria Extract, Cetyl Alcohol, Prunus Armeniaca (Apricot) Kernel Oil, Hydrogenated Jojoba Oil, Fragrance (Parfum)*, Limonene*, Citronellol*, Geraniol*, Citral*, Linalool*, Farnesol*, Eugenol*, Rosa Damascena Flower Wax, Lecithin. Use as a lip gloss over Dr. Hauschka Lipsticks or Lipstick Novum. Apply over Lip Balm for extra-protective care.